When St. Veronica Parish in North Philadelphia conducts a mission, it does it in style. 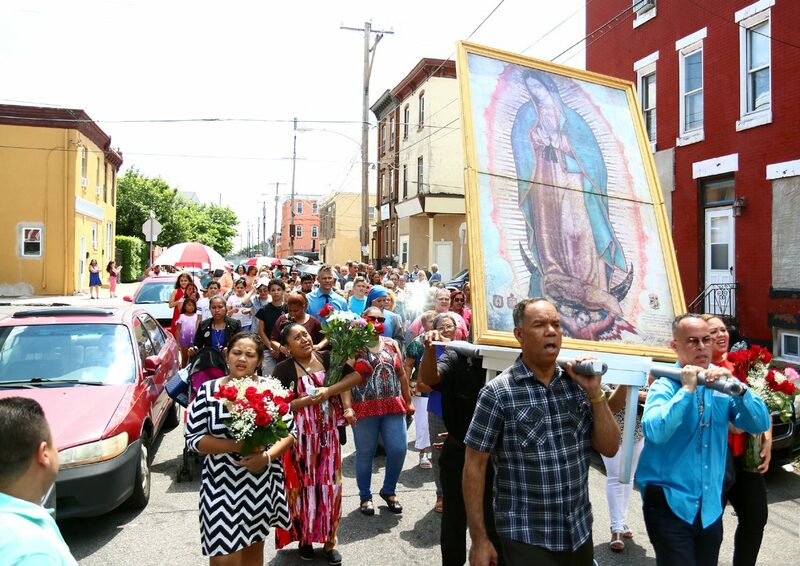 One of the highlights of a Marian Mission celebrated June 21-25 in the parish was a grand street procession through the busy neighborhoods on Sunday, June 24, dedicated to the Blessed Virgin. It followed a Mass at St. Hugh of Cluny Church, which is now a chapel of St. Veronica. “This is a special procession for our Marian Mission, putting Mary everywhere,” said Incarnate Word Father Joseph LoJacono, pastor of St. Veronica. The particular title of Mary honored during this mission and rosary procession was Our Lady of Guadalupe, a devotion that is especially celebrated in Mexico but has since spread through the United States and to other parts of Latin America, Father LoJacono explained. “We try to follow the Lord and be witness to the Lord by putting Jesus and Mary everywhere,” he said. 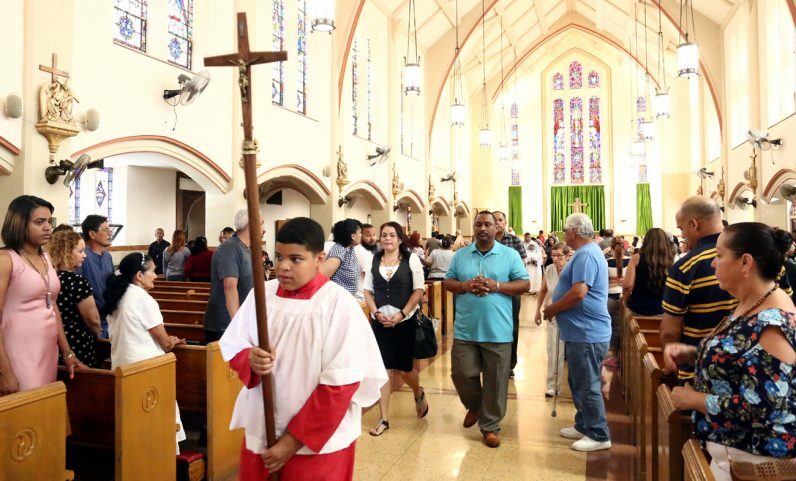 The Spanish-language Mass at St. Hugh definitely was not just “said” by the celebrant, Incarnate Word Father Augustin Bollini Roca, it was a celebration by the entire congregation. Come to think of it, that’s exactly as it should be. The Last Supper, the first Mass with Jesus himself as officiant, was a Passover feast, an occasion of joy. At this Mass, the several hundred mostly Hispanic congregants joyfully sang along or clapped along with the energetic choir. Afterward the procession, led by a large crucifix, an image of Our Lady of Guadalupe and flags of the United States of America and the Holy See, was led by Father LoJacono and joined by many congregants praying the rosary aloud. It prayerfully took a meandering route along the streets, joining up with others from St. Veronica before ending at that church about a mile away, where another Mass was celebrated. Along the way, residents stopped what they were doing and turned off their own music out of respect for Jesus and the Holy Virgin. Because that area of North Philadelphia has only been heavily Hispanic for the past few decades, most of those in attendance were originally from other countries or areas, but now have found a new home. Bena has only been in the U.S. for a few months, but speaks English as if she was born here. “I learned it as a child watching cartoons on television,” she said. Most people don’t think of the U.S. as a mission field, but it is matter of perspective. Accompanying Alfaro was Sister Maria, a member of the Servants of the Lord and the Virgin of Matara, and a native of Colombia. Although a religious sister for 24 years, she is only two years in America, and one of four of her congregation at St. Veronica. “These are good people here with a lot of faith,” she said. In the words of the people praying Hail Marys in the procession: Santa Maria, Madre de Dios, ruega por nosotros pecadores, ahora y en la hora de nuestra muerte. This is a beautiful story about St Veronica but it makes me mad to read about singing and clapping with the energetic choir. We had a beautiful choir at St Veronica. It’s not fair that St Hugh has a beautiful choir and we cannot have one. I have been a parishioner from St V since 1983 and the Masses are not the same without the vibrant music. Another informative and inspiring article by Lou Baldwin. How can I get in touch with Lou? Thank you to all the Parishioners who keep St. Hugh of Cluny open and vibrant. My prayers will always be with you. Be with us O Mary along the way, guide every step we take. I had the privilege to walk the streets during the Mission with 2 parishioners from Corpus Christi Parish and Sisters of Servants of the Lord and the Virgin Matara. Last week prayed the rosary while the Sisters engaged and spoke with neighbors inviting them back to church. It was a powerful day. I’m glad I decided to go. I will continue to keep St Veronica’s and the parishioners and neighbors and the Sisters in my prayers.